Crab meat, less stringy, more versatile than lobster & infinitely cheaper, so you wonâ€™t feel the pinch when it comes to paying for the shopping. 1 Combine the honey and vinegar with a large pinch of salt and 3 tablespoons of water. Add the slices of cucumber and avocadoes. Toss gently and leave to infuse while you make the crab cakes. 2 Mix the crabmeat, spring onions, ginger, fish sauce, chilli, coriander, eggs and panko breadcrumbs until well blended. Do this at the last minute or the mixture will become too soggy. 3 Divide the crab mixture into four and shape into flattened rounds. Heat a frying pan to medium. Add the oil and pan fry the crab cakes for 3 to 4 minutes. Don’t worry if they slightly break at the beginning of cooking. Lift one of the edges half way through cooking and check that the bottom is browning nicely. Adjust the heat if needed. Turn around and cook for 2 to 3 more minutes. 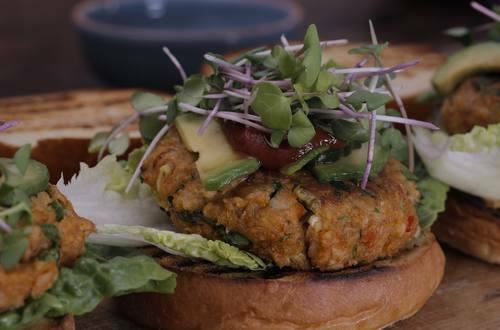 4 Place the crab burger on a bun or lettuce leaves, garnish with thin cucumber and avocado slices, micro herbs and a tbps of Hellman’s ketchup.